This article demonstrates supporting multiple output formats for your Spring 4 MVC application using Spring’s ContentNegotiatingViewResolver. We will be generating application output in XML, JSON, PDF, XLS and HTML format, all using Annotation based configuration. Let’s get going. ContentNegotiatingViewResolver is an implementation of ViewResolver, which uses the requested media type (based on filetype extension, URL parameter specifying type of output format or accept header) to select a suitable View for a request. ContentNegotiatingViewResolver does not resolve view by itself but delegates to other ViewResolver you can configure to handle specific views(XML,JSON,PDF,XLS,HTML,..). We will be using Spring Java Configuration(Annotations). Now let’s add/update the content mentioned in above project structure. spring-oxm is included to support XML output generation (using JAXB2). jackson-databind & jackson-annotations provide JSON output support. itext provide PDF generation library to support PDF output. Apache POI will help producing XLS output format. * convert object in JSON format. * in absence of any type suffix. First step is to create the ContentNegotiationManager which is used to determine the requested media types of a request by delegating to a list of ContentNegotiationStrategy instances. By default PathExtensionContentNegotiationStrategy is consulted (which uses the URL extension e.g. 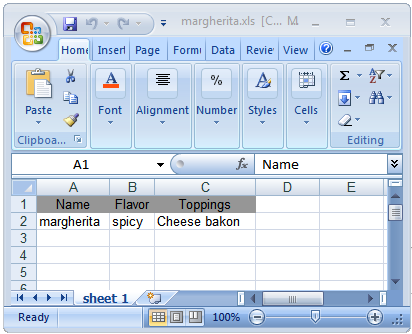 .xls, .pdf,.json..) , followed by ParameterContentNegotiationStrategy (which uses the request parameter ‘format=xls’ e.g. ), followed by HeaderContentNegotiationStrategy (which uses HTTP Accept Headers). In our example, we will be using the URL extension to help determine the media types. Also, we have set the default media type to TEXT_HTML in absence of file extension or when the filetype is unknown, that means JSP view resolver will be used when no [known] URL extension found. We need to set the ContentNegotiationManager which will be injected by Spring, and different resolvers for each possible output format our application might produce. Finally, we have created different view resolvers for XML, JSON, PDF, XLS and HTML output which we will discuss next. Let’s now create tha actual view resolvers itself. This view resolver relies on JAXB2 Marshalling/unmarshalling to produce XML output. The domain class needs to be annotated with JAXB2 annotations. 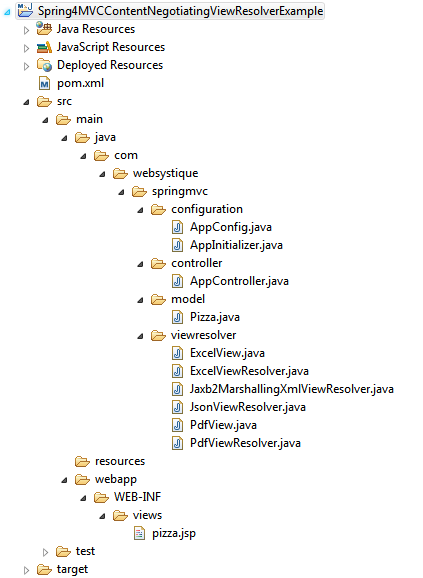 This view resolver is using Spring MappingJackson2JsonView to get the view used to convert POJO to JSON. This view resolver is using lowagie itext library to actually generate PDF output.Also note that actual view extends from Spring AbstractPdfView which itself internally uses lowagie itext library. This view resolver is using Apache POI library to actually generate Microsoft XLS output.Also note that actual view extends from Spring AbstractExcelView which itself internally uses Apache POI library. That is all needed for ContentNegotaingViewResolver configuration. To complete the example and make it runnable, let’s add the missing Spring MVC configuration peaces. Below is a trivial REST based controller for our example. Add an initializer class implementing WebApplicationInitializer as shown below(which in this case acts as replacement of any spring configuration defined in web.xml). During Servlet 3.0 Container startup, this class will be loaded and instantiated and its onStartup method will be called by servlet container. Now build the war (via eclipse or maven [ mvn clean install]). Deploy the war to a Servlet 3.0 container. Since here i am using Tomcat, i will simply put this war file into tomcat webapps folder and click on start.bat inside tomcat bin directory.